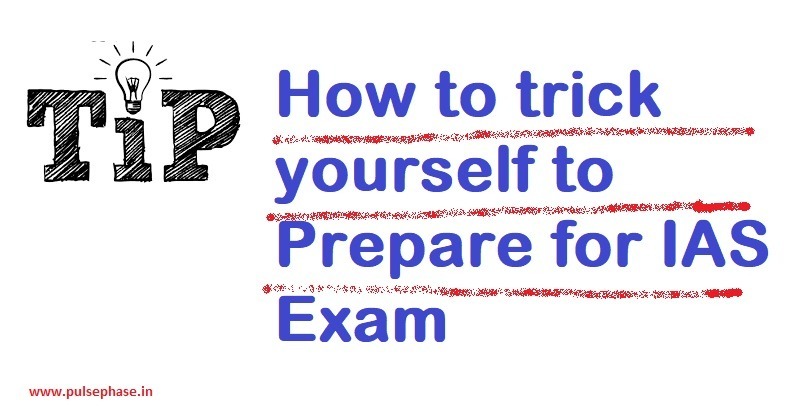 How to trick yourself to prepare for IAS Exam? So, are you ready to show off your writing skills in the upcoming IAS exams? By now, you must have grasped everything and ready to blow off the IAS Exam Preparation. If you are feeling like you had enough of that hard work and it’s time to kick off those writing assignments, then you must begin your revision for the final day. From the day you entered into the preparation zone of IAS; you must have gone through loads of advice for the preparation. What to say, they are needed to grab success in your endeavors. We are also here to make you little tricky with some summarized form of advice that will help you to strike off the bell. Let’s have a look at the tips. let’s transform yourself into a bookworm from now. Make the most of the time in studying right from the dawn to midnight. Go with writing, reading and revise everything to the maximum. since you are studying for IAS, you must have planned everything from your daily routine to study pattern. Just like that, plan your exam pattern as well. Make a wise choice since the beginning. Focus on prelims first. You have to face objective type questions which are quite tricky sometimes. Plan promptly as to where to begin and where you can gain more. Simply read everything that comes your way. Be it a news article and even a chocolate wrapper that you have thrown just now. Switch on the TV and watch channels like CNN and National Geographic or get in touch with best IAS coaching in Delhi. Make a habit to read the newspaper daily. It will surely help you in the long. mere clearing the examination will not work. You should prepare enough for your interview. To begin with, you must wear sober attire that neither make you under nor overly dressed. you should behave confidently in front of the interviewer. No need to get nervous. Remember, the person sitting next to you is just like you, a person of flesh and blood. Many times, the interviewer asks tricky questions which required the presence of mind. For example, if you were asked to state how many stairs you use while entering the cabin. It’s possible you haven’t count them but a quick reply without battling around with your mind will surely win the game. Remember, even the interviewer didn’t count them. Don’t forget to sharpen your communication skills before appearing for the interview. Don’t worry about the language. Whatever language you are using, you must learn the way of talking and answering the questions. I know that sounds little shocking but it’s highly commendable. Whatever exam you are going to face, you must have a sound sleep the previous night. It will wake you fresh and ready to crack the exam. Tricking into a successful IAS is not so difficult unless you are ready enough to follow all the rules strictly and with complete dedication. Simply follow the advice implied by the IAS coaching and you can surely win the battle. ← How to nail UPSC IAS Prelims?